The international community, though they seek to demonstrate a consensus on climate change and global warming through various agreements, the real work of minimizing and reversing environmental damage will be in the hands of national governments and businesses. Governments, like the forward-thinking government of the UAE, will be responsible for setting and enforcing environmental regulations. Businesses, too, have a crucial role to play. This is not only because they are one of the main sources of environmental pollution, but also because they have the opportunity and incentive to create innovative solutions to avoid and perhaps, reverse continuing damage to the ecosystem. Some examples would be investing in alternative energy sources and by implementing sustainability indicatives in the workplace. Every day, more companies are beginning to adopt more environmentally sustainable workplace practices, not only to fulfil their corporate social responsibility, but because sustainability makes business sense, in terms of reduced operational costs, improved employee health and well-being, and a better bottom line. Environmentally sustainable workplaces are those that seek to protect the environment, to conserve precious natural resources and to minimise damage both internally and externally to the business. In a previous post, we discussed how creating green working spaces through sustainable fit out has multiple benefits and positively impacts company results. A European Commission, 2015 study estimates that energy efficiency initiatives could save €280 to €410 billion. LEED buildings’ maintenance is 20% lower than typical commercial buildings. Green building retrofit can have an immediate effect of reducing operational costs by 10% in just a year. Employees in “Green” working spaces experience significant improvement in cognitive scores – Harvard T.H. Chan School of Public Health / Syracuse University Center of Excellence / SUNY Upstate Medical School, 2015. An improvement in indoor air quality due to lower concentrations of CO2 and better ventilation) has been linked to at least 7% improvement in employee performance –Park and Yoon, 2011. Studies suggest employees prefer to work in companies with sustainability credentials. At Summertown, we not only have deep knowledge and experience in helping different kinds of business with their workspace fit outs, but we are advocates of creating more sustainable working spaces, and for promoting environmentally sustainable working practices. We are constantly revisiting and fine-tuning our own sustainability strategy. 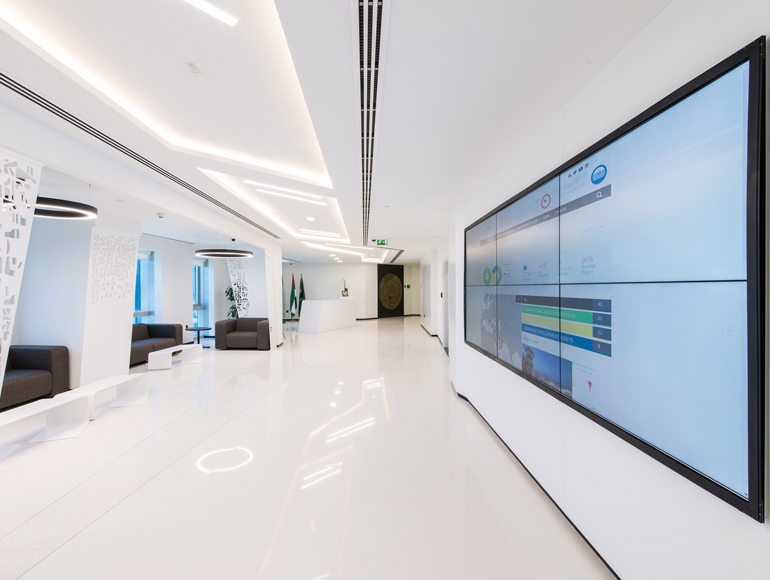 Being a green fit-out specialist in Dubai is not just our job; it is our mission. We are always eager to share our experience and knowledge with others to contribute to increasing environmental awareness in the UAE with specific focus on commercial interior fit out. Based on our experience, we have identified 7 key recommendations to create a greener, healthier, happier and more sustainable working space for you and your employees. Our main objective is to help companies go beyond just talking about becoming more environmentally sustainable and to start walking the talk. Some of these recommendations will possibly involve upfront investment. For example, in changing or upgrading plumbing fixtures and A/C equipment, others are simpler to implement but require longer term commitment to begin showing results like employee engagement initiatives. A sustainable interior fit out is the essential first step in creating an environmentally sustainable workplace. It creates the base conditions in terms of energy and resource consumption, lighting, air quality, thermal comfort and others. Aiming for an environmental certification such as LEED for a new fit out enables sustainable commercial interiors to be created to an international standard. There are also many cutting-edge technological innovations that can contribute to making interior fit out more sustainable. 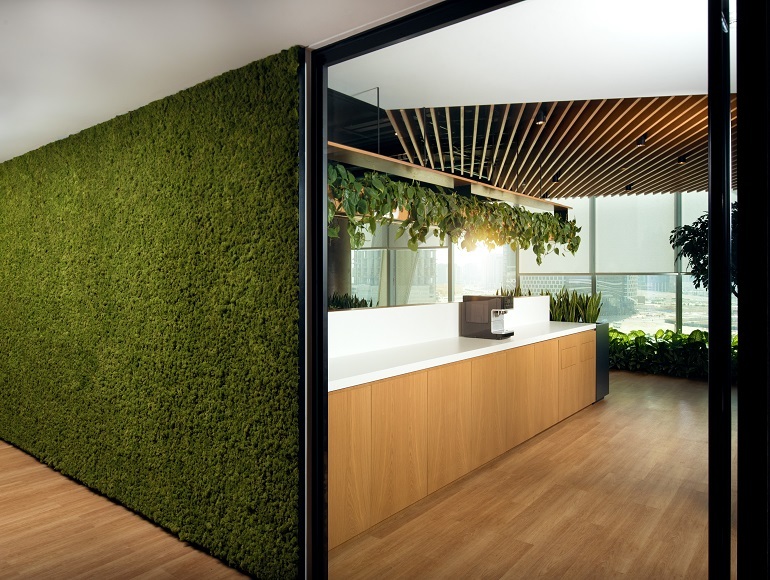 Green fit out enables the implementation of workplace practices that improve employee health and productivity, while cutting operational costs. 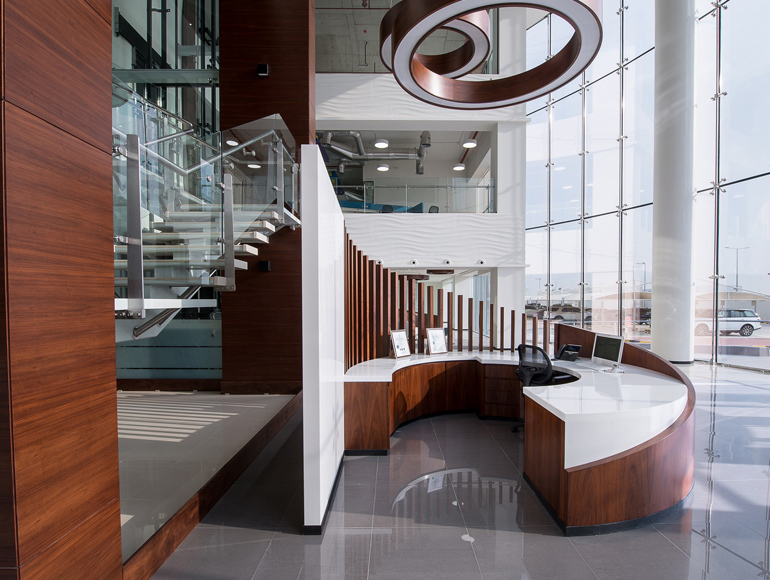 Experienced fit out contractors will also use environmentally sustainable materials where possible and reduce internal pollutants by using non-toxic paints and materials, contributing to improved indoor air quality. Perform an energy audit to find opportunities to cut consumption. The US Department of Energy says that just sealing leaks and cracks in the workplace can cut 20% of heating and cooling costs. Reducing water use in HVAC systems. Ensuring safe disposal for waste that cannot be reused or recycled. There are many ways to help office become a greener space. Workers can use different kinds of software and devices to work more efficiently, using time more effectively and cutting down on waste. For some companies, this will involve a shift in culture, and having clear policies requiring people to think and work differently. According to a TechRepublic rundown, a staggering 90% of all US office waste is due to documents being printed needlessly multiple times. The Emirates Environmental Group, a local NGO dedicated protecting the environment through education, action programs and community involvement, collected almost 1,800 tons of recyclable waste during a 2011 campaign, the majority of which was paper! Employees can be encouraged to go paperless, by reducing the number of printers, rationing paper and toner, and printing on both sides. Other ways to go paperless is to move to electronic invoicing and e-statements. Creating a collaborative work culture that uses online sharing tools rather than paper. Offices are living spaces. To ensure that a sustainable office remains that way, employee engagement is key. This includes motivating and involving employees in implementing sustainability measures. Smart thermal interior controls and recycling policies are positive, but so much more can be achieved if employee awareness of being sustainable is high. Incentivise Employee Environmental Behaviour: Provide employees with way to monitor their resource consumption and carbon footprint. Incentivise employee behaviour changes through competitions, coupons or gifts. For example, encourage employees to use public transport or to use hybrid, electric vehicles. At another level, one way of applying environmental concerns in the workplace is to put in place policies and procedures for sustainable procurement, as well as to examine all phases of the supply chain to see if environmental improvements are feasible. Summertown has just celebrated its 20th year anniversary; and have always had a clear vision and sustainability strategy inspired by global and regional sustainability goals including the UN’s Sustainable Development Goals, the Vision 2021 and the Green Agenda, as well as the UAE Happiness Charter and CSR Mandate. We are committed to sustainability in every corner of our business, as demonstrated by our achievement of being the first in our industry to achieve LEED Gold certification for our interiors, and first in our industry to achieve LEED Gold certification for our existing building; operations and maintenance (LEED EBOM). for on-going operations and maintenance of our Dubai headquarters. To meet the LEED EBOM sustainable criteria, we implemented a number of modification works including the installation of water sub-meters and energy monitoring units to enable us to effectively monitor and modify our resource consumption. We also revamped our MEP infrastructure, including installing carbon dioxide sensors to monitor air quality in our offices, creating a healthier workspace for our employees. While we focus on performing at a high level for our external clients, we are also committed to creating the best internal environment for our employees. It’s worth noting that our efforts mentioned earlier have been recognised, as we won the ‘Best Workplace Wellness Program’ Award at Happiness @ Work Awards. Our Health and Well-being programme is a critical part of our corporate sustainability strategy. Our 2017 program include regularly scheduled activities to improve employee health and being, such as healthy breakfasts, mindfulness workshops and group yoga sessions. Summertown has impeccable credentials and unparalleled experience in carrying out commercial green fit outs and in creating environmentally sustainable workplaces. Our commitment to provide our clients with high quality, creative and innovative solutions is unequalled. Contact us today for advice and guidance on how to make your workplace more efficient, more productive and more sustainable.